The hand-made Flower bowl in nickel-plated metal has a highly glossy polished inner surface with an outer surface featuring flowers in relief. The stunning bowl has a wide diameter of 67 cm, forming an attractive focus point for your interior. Complete your interior styling with the Flower Bowl, by studio PP. 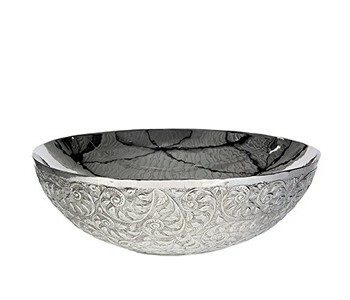 The substantial Flower bowl is a bowl that quite literally has two sides to it. The inside is highly glossy, almost reflective. While the outside has a detailed flower pattern design. The glossy inner surface forms a striking contrast with the undulating matte exterior. Using a large item as a design accessory, you create harmony in your interior. With a piece such as the Flower bowl, you can instantly change the whole look of your interior, without any effort. With its round design and organic patterns, the bowl brings a vibrant twist to a modern, sleek interior. 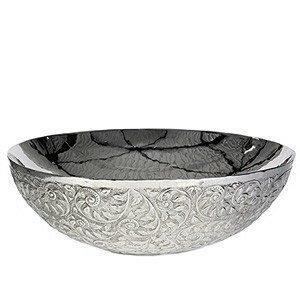 The Flower bowl's size makes it hard to overlook, and deserving of a prominent place in an interior. Think of a pedestal or a round dining table, where this bowl can really come into its own. Pols Potten has been offering creative solutions for every space for more than 25 years. Whether it's an interior for a showroom, a hotel, or your own home, Pols Potten has the right design object for you! The designs are subtle, innovative, and unconventional, with clear roots in Dutch design traditions. In our selection, you will find a range of bowls, as well as other Pols Potten products such as vases and candlesticks. Have a look around and mix and match to your heart's content!